If you want to learn more about the 2019 Kia Stinger, then just keep reading. 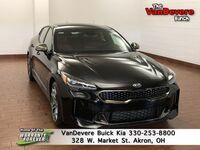 Otherwise, click the link below to see our current Kia Stinger inventory. If you are new to the Stinger, then the conversation simply needs to start under the hood. The Stinger has five trim levels in all and the first two both get a fun 255-horsepower 4-cylinder turbo engine. If you want to kick things up a notch, then you simply have to go to the GT, GT1, or GT2 trims. All three trim levels put a 3.3-liter V6 twin-turbo engine under the hood which can crank out 365 horsepower and 376 pound-feet of torque. Maybe you didn’t come to the Stinger for its engine performance but instead for its drivetrain configurations. Like a true luxury performance sedan, the Stinger comes standard as a rear-wheel-drive car at all trim levels. However, if you would prefer power to go to all four wheels, then you can opt for all-wheel drive at any trim level. At its heart, the Stinger is still a luxury model, and that’s why it comes with leather standard for 2019. The 2.0L and Premium trims both offer white and black leather, and the GT and GT1 trims offer red and black leather. You can kick things up a notch further with the GT2 trim which comes with genuine Nappa leather in either red or black. Of course, the Stinger offers the latest in Kia technology too like an 8-inch touchscreen with navigation and a plethora of infotainment options, but did you know that the Stinger is also a hatchback. It has sedan looks, but when you pop the trunk, the glass goes up too revealing 23.3 cubic-feet of trunk space. Not to mention this is still a four-door sedan with room for five and a total passenger volume of 93.8. Those numbers are almost as impressive as its 4.7-second 0-60 mph time.